For other uses, see Garland (disambiguation). A garland is a decorative wreath or cord (typically used at festive occasions) which can be hung round a person's neck or on inanimate objects like Christmas trees. Originally garlands were made of flowers or leaves. From the French "guirlande", itself from the Italian "ghirlanda," a braid. Garland created from the daisy flower (generally as a children's game) is called a daisy chain. One method of creating a daisy chain is to pick daisies and create a hole towards the base of the stem (such as with fingernails or tying a knot). The stem of the next flower can be threaded through until stopped by the head of the flower. By repeating this with many daisies, it is possible to build up long chains and to form them into simple bracelets and necklaces. Another popular method which involves pressing the flower heads against each other to create a look similar to a caterpillar. The terms "daisy chain" and "daisy chaining" can also refer to various technical and social "chains." In Alice's Adventures in Wonderland by Lewis Carroll, before Alice's adventures begin, she is sitting outside with her sister considering whether to make a daisy chain before being interrupted by a White Rabbit. Garlands appear in numerous poems, including La Belle Dame sans Merci by John Keats. In the Bible (English Standard Version), Proverbs 4:9 describes Wisdom as: "She will place on your head a graceful garland; she will bestow on you a beautiful crown." In the 1913 novel The Golden Road by Lucy M. Montgomery a "fading garland" is used as a metaphor for the evening of life or aging in general "[...] Did she realize in a flash of prescience that there was no earthly future for our sweet Cecily? Not for her were to be the lengthening shadows or the fading garland. The end was to come while the rainbow still sparkled on her wine of life, ere a single petal had fallen from her rose of joy. [...]". In the 2015 children's book The Railway Children by Edith Nesbit, garland is used as a metaphor as well: "Let the garland of friendship be ever green." In India, where flower garlands have an important and traditional role in every festival, Hindu deities are decorated with garlands made from different fragrant flowers (often jasmine) and leaves. Both fragrant and non-fragrant flowers and religiously-significant leaves are used to make garlands to worship Hindu deities. Some of those flowers are as follows: jasmine, champaka, lotus, lilies, ashoka, nerium/oleander, chrysanthemum, roses, hibiscus, pinwheel flowers, manoranjini etc. Apart from these, leaves and grasses like arugampul,maruvakam, davanam, maachi, paneer leaves, lavancha are also used for making garlands. Also fruit, vegetables and sometimes even currency notes are used for garlands, given as thanksgiving. Also in wedding the couple wears a wedding garland. In other occasions, it is used to show respect to an individual person or statue (murti).In Tamil Nadu marigold, nitya kalyani flower garlands are used only for dead bodies or burial rituals.In functions, garlands are used to denote the main person(host). A Gajra is a flower garland which women in India and Bangladesh wear in their hair during traditional festivals. It is made usually of jasmine. It can be worn both around a bun and in braids. Women usually wear these when they wear sarees. Sometimes, they are pinned in hair with other flowers, like roses. In Tamil Nadu temples (ancient) kings appointed people for making garlands daily for a particular deity. They were not allowed to sell that garland. Each Hindu temple in southern India has nandavanam (flower garden) where floral plants, trees for garlands are grown. Huge Shiva temples like Thillai Nataraja Temple, Chidambaram, Thyagaraja Temple, Tiruvarur and Arunachaleswara Temple, Thiruvannamalai still preserves such Nandavanams for supply of flowers for everyday rituals. Stone Inscriptions of Raja Raja Chola I at Thanjavur gives details of patronage of royals to the conservation of Nadavanams that belongs to The Big Temple. The flowers should be plucked in early morning. The flowers should not be smelled by anyone. They should be plucked only after having bath. The flowers which fell down on earth or dirt should not be used. Namajapam or the repetition of holy names should be done while plucking flowers. While making garlands they keep flowers and other materials on a table because the garland for God should not touch the feet. It is always kept above hip level. 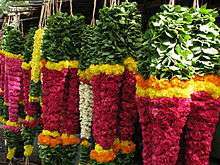 Thodutha maalai - which means garland made using fiber (usually banana tree fibers (vaazhainaar)) is used. Most of the garlands used for marriage, Gods are made using this method. It ranges in length from 1 1/2 feet to 12 feet and has a thickness from 2 inches to 3/4 feet in diameter. In all Hindu marriages the bride and bridegroom exchange garlands three times. Kortha maalai - made using needle & thread. Jasmine, mullai, and lotus garlands are made using this method. The maala for Gods has 2 free lower ends with kunjam (bunch of flowers), i.e. only the upper two ends are joined and the lower ends should not be not joined. It has two kunjams. Whereas garlands for humans have both lower ends joined together (only one kunjam). 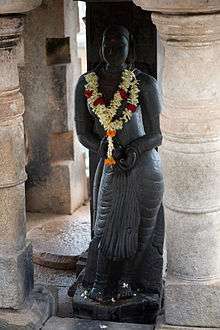 Each Hindu deity has a unique garland: Goddess Lalitha wears hibiscus garland, Lord Vishnu wears tulasi leaves garland, Lord Shiva wears Bilvga leaves garland, Lord Subrahmanya wears jasmine garland, Mahalakshmi wears red lotus, Saraswathi devi wears a white lotus garland. Durga Devi wears nerium oleander garland, Vinayaka wears garland made of Durva Grass. ↑ Mackay, Charles (1877). The Gaelic Etymology of the Languages of Western Europe: And More Especially of the English and Lowland Scotch, and Their Slang, Cant, and Colloquial Dialects. Trübner. p. 100. Retrieved December 5, 2015. ↑ "Make a Daisy Chain". BBC Gardening. Retrieved 2 April 2013. ↑ Singh Randhawa, Gurcharan (1986). Floriculture in India. Allied Publishers. p. 606. ISBN 8170230578. ↑ "Thanjavur Periya Kovil - 1000 Years, Six Earthquakes, Still Standing Strong". Tamilnadu. 2014-01-27. Retrieved 2014-07-29.